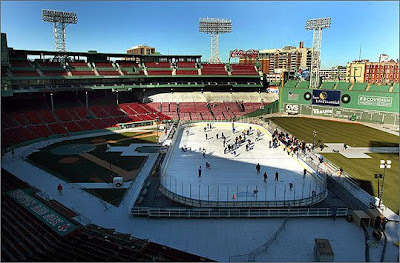 Were any of you fortunate enough to score free tickets to the Fenway skating event later in January (here)? Because if you weren't, chances are you're not going to be able to afford them on the resale market. It's kind of disappointing. Tickets for the extraordinary skating opportunity at Fenway, handed out to city families as part of Boston’s New Year’s celebrations, were going for as much as $1,800 for four on websites such as Craigslist and eBay, outraging city officials and event organizers who want to know the identities of the people conniving against others for a buck. The pic above from the Globe is about as close as I'm going to get to the rink this year. 0 Response to "Fenway Skating Tix Not So Free Anymore"
Dancing With the Stars @ Park Plaza - Tonight! Trader Joe's Coming to the South End?